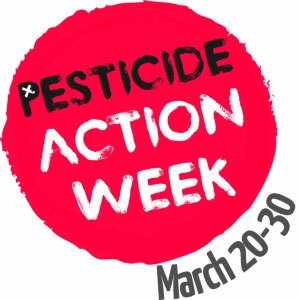 The Office International du Coin de Terre et des Jardins Familiaux and the affiliated federations call upon all allotment gardeners to take part in the Week without pesticides organised from 20th till 30th March 2019. The consequences of chemical control in agriculture and in our gardens are well-known to us; this via countless campaigns, news articles, etc. The period of effectiveness of the chemical products is limited and thus they have to be reused yearly and sometimes several times a year. These products offer no durable solution for future agricultural or gardening models. The yearly treatments and curative actions to kill all plagues and diseases result in possible resistance. This can be compared to the resistance of bacteria in medicine, which have nearly become indestructible due to a random use of antibiotics. The Office International du Coin de Terre et des Jardins Familiaux and its members wish to promote alternatives during the week without pesticides 2019. This week is symbolic and is an ideal moment to start changing our habits. The alternatives might not always give the wished for results in the first year, but in the long run they will. Also less perfect looking fruit and vegetables are healthy, because they have been produced in a sustainable way. Gardeners have to think with/like nature. One of the ground rules is 'survival of the fittest'. Choose resistant plants which have a natural resistance against diseases, e.g. Sarpo Mira potato that is resistant against the potato pest. Often the wild or older races are interesting as throughout the years they have built up their resistance by natural selection. They are often smaller and less pretty, but keep longer and have a better taste compared to the F1-hybrids from the store. Moreover, from these old and wild races you can harvest the seeds for next year, something which is impossible with the F1-hybrids. Gather friends and use them! Do so literally by organizing a 'crowd weeding' where you remove the weeds in a group. Another option is to use insects to control the population of other insects and plagues. Organise your garden to welcome them, offer shelter, food abundance, etc. -	lacewing (vs. whitefly) ? If you don't know them yet, be sure to check them out! Our last advice, but as a gardener we advise you to start with this one, have a good garden plan! Crop rotation in the vegetable garden is a start. Take soil samples every three years and fertilise as advised. These steps will give you a solid base and healthy plants, and healthy plants are less likely to get ill. The Dutch, Flemish and Swedish federations have already initiated special projects and created a quality mark for gardening without pesticides. Please check if similar activities can also be launched by your federation. Help your associations and their members to change to another way of gardening and maintaining their garden sites. 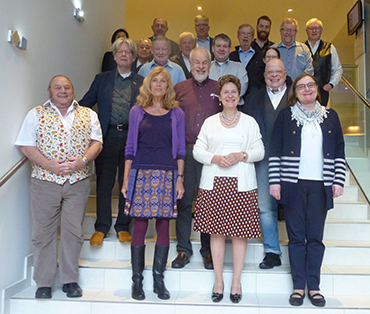 The national delegates met in Luxembourg on March 8th and 9th, 2019 for their annual statutory general assembly. 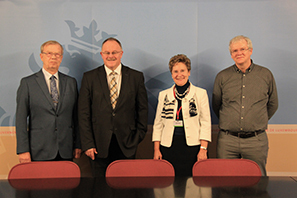 Before the meeting chairman Wilhelm Wohatschek and general secretary Malou Weirich had a meeting with Romain Schneider, minister for Agriculture. During this meeting they could present the Office’s new strategies to the Minister. He assured them that he will both morally and financially support the publishing of the brochure “The soil is living” in several languages. The executive board and the national delegates thank the minister very heartily for his recognition and support. In addition to the statutory missions, the conclusions from the study session in Kortrijk were drawn. The cornerstones for a greater internal and external efficiency of our work were further discussed. The Office homepage should present examples of good practice and be developed to become a platform to present knowledge and expertise. To this effect it was decided to acquire an expertise in the domains as for example: climate, water, public space, thanks to a cooperation between two or more federations. The Dutch federation presented its activities, successes, problems as well as its innovative strategy for the future in a very interesting lecture. In the future they will, in addition to their current missions, focus especially on amateur gardeners who are not members of the federation. All the other federations informed on their activities. This exchange brought interesting insights and gave – according to what was needed – stimulations for national activities. The next issues of the Hyphen will deal for example with the topics: Environment justice, diversity of allotments, pilot projects of the federations. 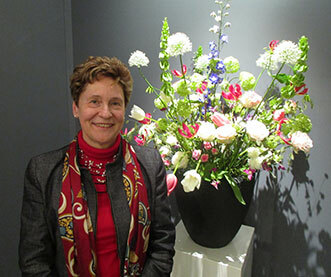 The Office and the affiliated federations will also take part in the week without pesticides in 2019 and publish a memorandum on the Office homepage, the national homepages as well as in the national allotment magazines. The delegates will meet again during their study session in Graz (Austria) on coming 21st August. The next statutory general assembly will take place in Luxembourg on March 6th and 7th, 2020. “It is amazing what you can do, if you just have the courage to try”. You may be wondering why I am writing this sentence at the beginning of this article at the start of this new year. The national federations and the Office, i.e. the whole allotment movement, are facing great challenges, both internally and externally, in order to properly shape the future. The considerations have already started to respond to our new environment. Courage and farsightedness are necessary. Internally, we must increasingly become a service organisation for our members. Our magazines should be modernised, wherever necessary. 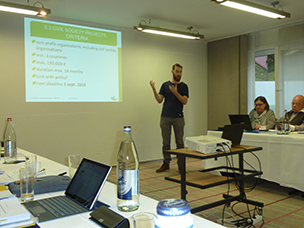 Not only information from our associations, but also examples of good practice from home and abroad, as well as subjects as for example ecological gardening, permaculture, climate change, water protection etc. should be dealt with. A reactive homepage, a good facebook site and the use of other social media will further carry our suggestions inward and outward. An optimal networking with other allotment organisations and the conclusion of strategic partnerships will support our efforts and help us to make us more visible. Additionally, we have to train our associations and members and give them the necessary assistance in their garden and in the associative life: specialist gardening advice, seminars concerning the application for financial support, club management, accounting, conflict solutions etc. These are just a few examples of our commitment towards the individual allotment gardeners and associations. Also externally, in a new environment, we have to position ourselves differently. Today, the new forms of urban gardening are enormously praised by people and politicians and the allotments, part of this urban gardening, are often forgotten. Our many years of experience and our continuous contribution in the social and environmental areas are not sufficiently perceived. Other “green organisations” often try vocally and without any consideration to push us aside. Furthermore, there is on one hand a lack of land to create more plots in urban areas, while on the other hand we find vacancies in rural areas. In order to counteract this tendency we have to be better perceived. People, other organisations and authorities need to understand what we stand for, today and tomorrow. We have to underline our advantages, our services to society, our experience and know-how. We have to work out a vision for our movement, a vision that will enable us to make the movement, wherever necessary, more efficient, to promote and protect it. A pioneering spirit is needed. The members have to understand what we do; they have to be taken on board. This vision, this common goal, must then unite the members and motivate them to work together with their boards for the development and the taking into consideration of our concerns. We need progress: we have to innovate and to find solutions to the new challenges. On the one hand, we have to reduce the plot size to shorten the waiting lists, to take into account the problem of lack of time of the working people and their lack of horticultural knowledge. On the other hand, we have to carry out projects on empty plots, involve partners and work out with the authorities, wherever necessary, an allotment development scheme and find solutions acceptable for all ……. In these reflexions and actions we can/must consider the statement of Bill BRADLEY: “Ambition is the way to success, perseverance is the necessary instrument”. I wish you good health for 2019 as well as courage, ambition, pioneering spirit, optimism and perseverance, in order to consolidate and develop our movement.